Cost to install laminate flooring varies greatly by region (and even by zip code). Get free estimates from flooring contractors in your city. Cost to install laminate flooring varies greatly by region (and even by zip code). The cost of installing laminate flooring is $1,600 - $5,000. Laminate flooring is a manufactured multi-layered synthetic floor that is fused together using a lamination process, which simulates the look of wood, stone, or tile with a photographic layer under a clear protective layer. There are many benefits to installing it due to its durability (up to 30 years) cheaper price, and ability to withstand exposure to debris and water. One would assume that the smaller the square footage, the lower the price. For lamination installation however, this is not true. The smaller the area in which the floor is being placed, the higher the cost will be per square foot. This is because a lot of trimming will be involved and it is more time-consuming. Location is another factor taken into account in the cost estimate you will receive. For example, if you have a set of stairs or a landing in the area, you can expect the price per square foot to be higher. This is because it will require more materials to work around the area, and more trimming and maintenance will be involved. Deeper colors of laminate are often considered premium colors and can boost the cost, whereas the lighter, less popular colors are often cheaper. Whether the material of the laminate is slate, tile, or wood does not affect the price. Time of the year could affect installation costs for laminate flooring. Fall is a very busy time for contractors and carpenters because many want their renovations completed before the winter holidays. Late winter months, running into the new year, tend to be the best time to find deals on installing laminate flooring because they are less busy and customers do not have as much money to spend on renovations after the holidays. Some laminates have a built-in underlayment 1. Others require that you purchase a separate foam padding 2 ($30.00 per roll) that provides cushioning, absorbs sounds, and helps to even out subfloor 3 unevenness. A separate moisture barrier, or an underlayment 1 with a built-in moisture barrier, ($35.00 per roll) is required for below grade installations or moisture-prone areas. Buying flooring with pre-applied underlayment 1 will save you money in labor, but it is more expensive. For a basic project to install underlayment 1 for 125 square feet, the cost starts at $2.95-$4.57 per sq.ft. 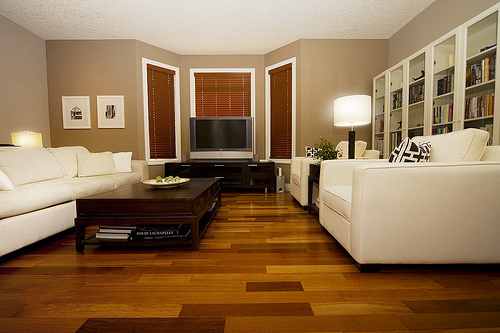 Laminate flooring is offered in different levels of thickness. Typically laminate is available from 8mm all the way to 12mm in thickness. All laminates are dent resistance; but the thicker the laminate, the less resistant it is to bending caused by an uneven subfloor 3. The thicker the laminate also means less noise resistant. The average cost for an 8mm laminate is $1.79 per sq.ft., 10mm is $1.99 per sq.ft., 12 mm is $2.29 per sq.ft. Embossed: an overall style texture not specific to the decor. This texture ranges in price from $1.79-$2.99 per sq.ft. Embossed in register (EIR): this helps to give off the natural look of hardwood. It adds depth and texture in the alignment of the floor. This texture ranges in price from $1.89-$3.99 per sq.ft. 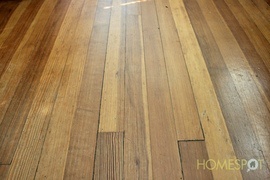 Handscraped: the laminate is pressed to resemble a real handscraped hardwood floor. This texture ranges in price from $2.99-$5.99 per sq.ft. Gloss finish: this gives the laminate a glossy finish and can make it look more eye catching and stand out more. This finish is used in many event or club locations. Matt finish: this type of finish gives off a “matt” effect. This is commonly used for corporate printing for professional businesses. Wood finish: they are designed to treat timber. It gives an aesthetic touch. The AC rating is a representation of laminate’s resistance to wear and suitable location for the laminate floor to be installed. These also will indicate whether the laminate flooring can be used in commercial or residential areas. These ratings are based on a scale of 1 to 5. The higher the rating, the higher the durability and cost. 1 Moderate Residential For areas with little use or light foot traffic. 2 General Residential For home use with moderate foot traffic. 3 Heavy Residential/Moderate Commercial Designed for home including all high foot traffic areas such as the kitchen or foyer. 4 General Commercial Can withstand all kinds of residential use of high traffic spaces such as offices and cafes. 5 Heavy Commercial For heavy commercial traffic such as department stores and government buildings. There are numerous brands of laminate flooring on the market. Below are some of the most popular brands and their cost. Quarter round molding: fills the space where the floor meets the wall. Quarter round molding costs between $0.99-$2.99 per sq.ft. Threshold molding: finishes the space where the floor meets the carpet, or where a wall-base can’t be used. Threshold molding costs between $3.25-$6.99 per sq.ft. T-Molding: finishes the space between the floor and 2 pieces of laminate. T- molding costs between $3.49-$5.99 per sq.ft. Flush stairnose: finish used for step downs, stairs and landings. Flush stairnose costs between $4.49-$6.49 per sq.ft. Step nose: used when the laminate floor meets a step or landing. Step nose costs between $4.95-$9.99 per sq.ft. The average cost to install laminate flooring per square foot is between $2 and $8. This cost includes the cost for a mandatory foam underlay 4 and other adhesives or glues that are required for the project. The labor for installing laminate is not that difficult. A contractor will do the installation and charge either per hour or per project. The contractor begins the labor and installation of laminate by starting with the underlayment 1. They will unroll the underlayment 1 and run it across the whole floor to put it into place. The adhesive strip is placed face down and the plastic end is facing up. He will continue the project with laying out the laminate. He begins with the first row and cuts the strips into desired width and length. He makes sure to keep an expansion space in and places in spacers. He staggers the joints according to the recommendations. A contractor will begin the process starting in the left hand corner of the room working their way to the other side. Laminate flooring can be installed over the existing floor, which can save some time and hassle, however, this could lead to a non-level floor in the future. Many homeowners feel that the removal or replacement of subflooring 3 is beyond their skill level and will hire a carpenter to lay a new subfloor 3 or remove the old. The average carpenter will charge around $70 per hour, and it should take no more than a day. It is a good idea to remove the old flooring before they arrive to install the new flooring. Approximate cost of removing a 200 sq.ft. floor is $400. If you already have baseboards present in the room where you are installing laminate flooring you can do one of the two options: remove the baseboards and reuse or replace them after flooring installation, or leave the baseboards in and install quarter round to cover up the gap between them and the floor. The cost of baseboard materials are reasonable, ranging from about $0.70 per sq.ft. for basic styles up to $1.50 per sq.ft. for more premium styles. It is possible to hire a carpenter for this job that will charge around $70 per hour. When installing laminate flooring you can also look into enhancing the floors using radiant heating. Radiant floor heating 5 cannot be installed on existing flooring, so it is a good time to look into this improvement. They are installed in places where warm floors are sufficient such as bathrooms, kitchens, and mudrooms. Radiant floor heating 5 system installations are typically expensive and will require a professional to install the system. According to RadiantDesignInstitute.com, a well designed radiant system will cost “less than $3 per square foot, and less than $2 for a slab on grade." An average cost for installing radiant floor 5 in an average home size is anywhere from $6000-$14,000 depending upon the time it takes the work to be completed. To keep refinishing costs down it's advisable to remove old carpeting and other flooring that is covering your hardwood floors yourself before you hire a professional to refinish your floors. 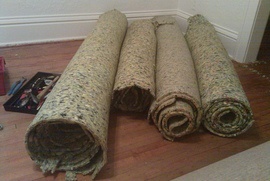 Carpeting, pads 2, and sheet flooring can be removed quite easily, while tile is a more labor intensive. You can use glue on laminate flooring. It is a good idea to use glue in areas of high foot traffic and where spills of liquid is a high possibility. Glue can help strengthen the installation of the floor and make it water-resistant. Hire a licensed and insured professional to do the work to ensure it is completed properly. Make sure to purchase 5%-15% more flooring and underlayment 1 than needed. You want to be prepared in case a piece is damaged or you end up needing extra. It is important to get at least 3 written estimates for the work. Sometimes you may be dealing with the wrong company/person that will charge you a lot more than they should. It is important to ensure that the subfloor 3 is perfectly level because laminate is not attached to the subfloor 3. Make sure to read up on the manufacturer’s specifications for the variation. Generally numbers that are accepted are 1/4” to 3/16” range over 10”. 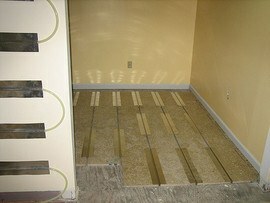 Having a laminate floor installed over an old/poor subfloor 3 can cause noise and flooring issues. To make the room look larger, install the planks parallel to the main view of the room. 2-4 days prior to installation, let the flooring acclimate to the room. You cannot stain or finish laminate floors. You will have a smaller resale value of a home with laminate flooring compared to real wood flooring. Do not install laminate flooring in areas of the home with high humidity, such as the bathrooms, laundry rooms, and sauna. Laminate floors will contract and expand with fluctuating humidity and will expand and push against each other, resulting in ridges and bulges in the floor. Laminate has a warranty of 30 years or more with the proper treatment and little maintenance. Laminate installation is easy for homeowners to do themselves. It should only take about half a day to a full day. You may require the use of a miter saw. The laminated pieces can be laid on a subfloor 3 or existing floor surface. The pieces snap together over a foam underlayment 4 without using glue. Maintaining a laminate floor is easy. They do not require any waxing and can be mopped with a damp mop or swept. How do you install Pergo flooring? Start off by preparing the floor for installation; by removing any debris. Next you will install the vapor barrier 6 , this will help with moisture on the floor. Lay the Pergo floor starting in the back left corner of the room, continue doing this in rows. Continue laying until the floor is all finished. What tools do you need to put down laminate flooring? Some tools you will need to install laminate flooring are: spacers, pull bar, tapping block, goggles, utility knife, hammer, pencil, tape measure, router, drill, and floor cleaner. Is it easy to install a laminate floor? Installing a laminate floor can be very easy if the directions are followed properly. Most DIY workers complete the whole floor in a day. How do you install snap together laminate flooring? To install the tiles, remove the tongue from the first piece. That side will face the wall. Place the tongue of the second plank into the groove of the first, starting an angle. When the tongue fits into the groove, press down until it snaps into place. Continue this working in rows. *Leave a ¼ inch gap at the edges of the room to allow for floor expansion. The cost of professional installation of laminate flooring ranges from $1.50 to $3.00 per sq.ft. The cost to install a laminate floor in the average 200 square foot kitchen (measuring 10'x20') costs $2,475. The average cost to install 1000 square feet of hardwood floors is $9,200. How much does it cost to laminate the floor? The cost of laminating the floor starts at less than $1.00 per square foot up to $5.00 per square foot. How much does it cost to install laminate flooring in my city? Cost to install laminate flooring varies greatly by region (and even by zip code). To get free estimates from local contractors, please indicate yours. The cost guide has been remade adding more information and updating the costs. The sections "Factors affecting the cost", "Types", "Thickness", "Textures and finishes", "Abrasion Class rating (AC rating)", "Brands", "Molding and trim", "Installation and labor", and "Flooring removal" have been added and now there is more detailed information about the different options, possibilities and price ranges for this project. For example, you can find information about what the AC rating is what is the meaning depending on the number of the rating. You can also find new tables with the types of laminate flooring, the most popular brands, and their cost. Moreover, new options have been added as enhancements like adding new baseboards and radiant floor heating, that may not be included in the average project but may interest you. The "Additional considerations" section now offers information about how to save money and hire the best professional, installation considerations, warranty, and DIY projects. A "FAQ" section has been added, where you can find any other piece of information that may not be found in other sections.